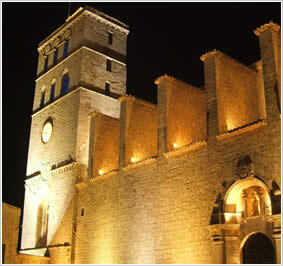 Placed to South of the island, “Ibiza Town” or “Eivissa” it is the principal town and, at the same time, the historical center. it is one of the most picturesque cities of the Mediterranean; the Carthaginian ones began to build this place in the 7° century and subsequently the Romans completed the job building the walls of the city and some imposing buildings. In the 16° century to assure the protection from the pirates north-Africans they were built taller and thick walls, which are today still visible. The “tall city” or “Dalt Vila” it overhangs the sea and it has a spectacular cathedral, particularly beautiful when he is illuminated by the nighttime lights. Built when the man didn’t require the automobile yet, the only way to enjoy this place is afoot, walking on the characteristics paved roads, admiring the sea from the top of the cathedral or snooping around the museum. For the one who loves the shopping it finds here the vast variety of shops, from the boutique of design to the “shop” of cakes sorts in the house; the center has succeeded in not becoming commercial, with only a handful of principal roads it is the perfect place to find original articles. At night Ibiza is crowded of people that the evening enjoys him snooping among the stands of the I bring, drinking something in a cafe or eating in one of the so many restaurants. Among the so many activities that this place offers the possibility they are inclusive to rent boats or yatch, to make immersions, daily excursions in boat to Formentera and the other numerous beaches of Ibiza, the Bingo, the Casino, the cinema and so much other anchor. The I bring it is situated in the low part of the old city, here you can find many gods best restaurants. In the cafes along the I bring of Ibiza city you can see, with a lot of probability, famous characters before all go to the discos; the I bring it is also the point of departure of the ferries for Formentera, Palma, Denia and Barcellona. 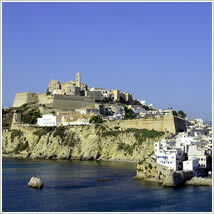 The beaches of Ibiza cities are Talamanca and Figueretas. Sea Botafoch and Talamanca rise in front of the I bring of Ibiza; Sea Botafoch is an exclusive area and of tall class, you take a walk along the harbor among the yatches of luxury or eats something in one of the most refined restaurants. Also the “Pacha” and the disco “El Divino” they are situated here. The beach of Talamanca is a long sandy beach, the favorite from the vacationers. The apartments vacations in this zone, the villas, are particularly for the most greater part luxurious. 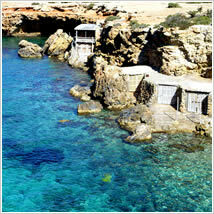 Situated near Talamanca, Jesus is an animate country with a relaxing atmosphere. 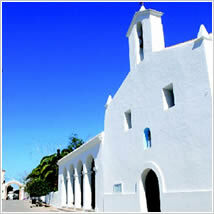 It boasts a series of restaurants that they use fine-ethnic kitchen and one the most important churches of the island. It also entertains the greatest artistic treasure of Ibiza, an altar finished at the end of the 16° entitled century “You virgin and the child”, notable mainly to have survived intact to more than five hundred years of invasions. This beach is situated on the other side of Ibiza city in comparison to Talamanca. it is a sandy bay with an I walk complete, rich of cafe and restaurants; this zone extends to offer the setups more economic vacations of all the other zones of Ibiza city. Situated among Ibiza city and the airport, San Jordi consists of a lot of villas of country punctuated around the beautiful church and to the commercial center. Communicating with the beach of Figueretas and neighbor in the airport, Playa den Bossa entertains the longer sandy beach of the island. This famous place of vacation offers something to each; in the opposite part to the beach aquatic sport, centers of immersion, a great aquatic park, funs, mini sweaters, bowling and cafe of diversion can be found. For those people whom the parties love there is a beach where music there is the whole day, the “Bora Bora” and to few footsteps the disco “Space” famous all over the world, without counting the cafes in which to stop before going to dance. As to Figueretas, the setups in this zone are primarily apartments vacations and hotel. Placed to South of the island, this wide beach of white sand, is one of the most famous to Ibiza and the more one is considered to generally the fashion with its refined person selection of cafe and restaurants that serve savory food with a fresh musical foundation. A lot of the most luxurious villas of Ibiza are situated to the Salinas, often completed by an enviable sight on Formentera.